Every woman wants to look great doing whatever they are doing like cooking. With Flirty Aprons, you can cook in style. The aprons are designed so that any woman wearing it can look beautiful in it. The aprons tie from the back which allows you to adjust the length so that it fits perfectly. The aprons are durable and above all looks great. 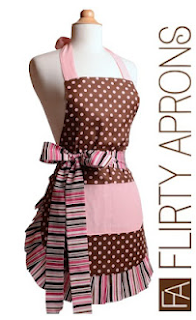 Flirty Aprons have lots of different designs that you can choose from. They even have aprons for kids and men. When I got my Chic Pink apron in the mail I was excited. I am a petite girl who is not very tall so there are not too many aprons out there that fit nicely let alone look good. Flirty Aprons not only was chic but I don't have to worry about it being too big. Although the fabric of the apron is a little thin for me, it still does its purpose as well as make me look good cooking. It is one of the cutest aprons I have ever seen. It made cooking much more fun and I do not like cooking. I love the VERY CHERRY apron so much! I like the Marilyn Venetian Rose. The frosted cupcake apron is absolutely adorable! This apron is so cute ! Would love to win ! Thanks ! I like the Women's Apron KayDee Kiss the Cook. I like the Women's Original Cocoa Lime. Thanks! Aqua Damask is my favorite! So cute! Would definitely make getting dirty in the kitchen so much more fun! Thanks for the chance!